On a recent trip to Italy we had the pleasure of staying with friends (who feel more like family). The Pesce family is everything we love about Italians. They are a warm, outspoken, gregarious bunch of Napolitani who welcome you into their home as if they’ve known you for your entire life. The family convened for the holidays in a small town near Perugia, Monte Castello di Vibio, where they own a beautiful holiday home. Deep in the Umbrian countryside, far from Napoli and its salty Mediterranean breezes, we learned immediately that the Pesce family had taken Campania with them… Mozzarella di Bufala, Gragnano and all. Carla, the family’s gorgeous matriarch, began feeding us immediately upon entering the house. And she didn’t stop feeding us for 7 days. She is a raspy-voiced, slightly blonder version of Sofia Loren, with an attitude. I loved her immediately. I was ready to adopt myself into her family when she brought out the beautiful fresh cheese she had transported from her neighborhood in Naples. This cheese is nothing like you’ve tasted anywhere else in the world. There is something irreplaceably special about the Mozzarella di Bufala from Napoli. It has a tartness, a slightly fermented edge to the flavor that truly highlights that creamy, squidgy cheesiness. There is an authentic tender give in the texture of the cheese that bleeds fresh, white whey over your palate. It truly is the perfect accompaniment to fresh tomatoes. And the best wine to pair with it? For my money, Gragnano. I love Gragnano for its simple, grapey, happy deliciousness. This is an inky black wine, native to the area around Napoli, has tiny bubbles and varying levels of residual sugar. Never too sweet, always a little spicy with notes of black pepper to perfectly counterpoint its fruity freshness. Low in alcohol, served chilled, and perfect in stubby water glasses; this, happily, is not a serious wine. Once the Pesce family understood our interest in local wines and food they just had to share this bottle with us. I love that proud moment when an Italian teaches you something about their local history, their neighboring winemakers or typical products. The big smiles when they see you enjoying yourself- unabashed delight and satisfaction. Pride. We might not have been in Napoli, but we sure did celebrate like we were. Forza, Napoli! Fiorano. Wines this F*ck*ng Great Inspire a Little Bit of Jealousy. I’m sure you ate and drank well. 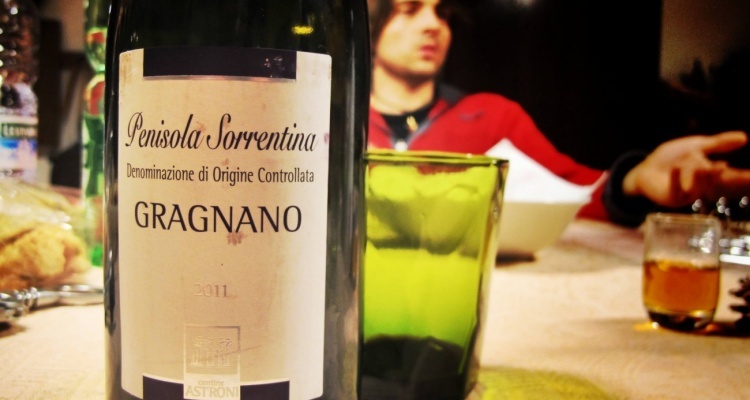 Unbelievable… An american girl who drinks Gragnano! We really loved reading your blog! I LOVE Gragnano! Che bel vino- spettacolare con la cucina di Campagnia, ma anche con i salumi di Emilia Romagna. Se non bevo un bel bicchiere di lambrusco con queste cose, sempre Gragnano!